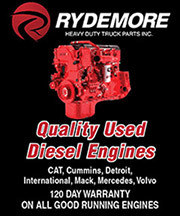 Engine: PACCAR PX-9 Horsepower: 330 Transmission: 6 Speed Rear Axle: 23,000lbs. Engine: Caterpillar 3406E Horsepower: 475 Transmission: 13 Speed Wheel Base: 250 Inches Rear Axle: 40,000lbs. Engine: PACCAR MX Horsepower: 500 Transmission: 18 Speed Wheel Base: 232 Inches Rear Axle: 46,000lbs. Engine: PACCAR MX-13 Horsepower: 500 Transmission: Automatic Wheel Base: 236 Inches Rear Axle: 46,000lbs. Engine: Cummins ISX-15 Horsepower: 550 Transmission: 18 Speed Rear Axle: 46,000lbs.